Although Bruest heaters run on gas, (be it from cylinders, a tank, or mains) there is no flame whatsoever. Once the heaters have warmed up to reaction temperature using their in-built electrical pre-heat elements, the platinum-based catalyst combusts the gas flamelessly. 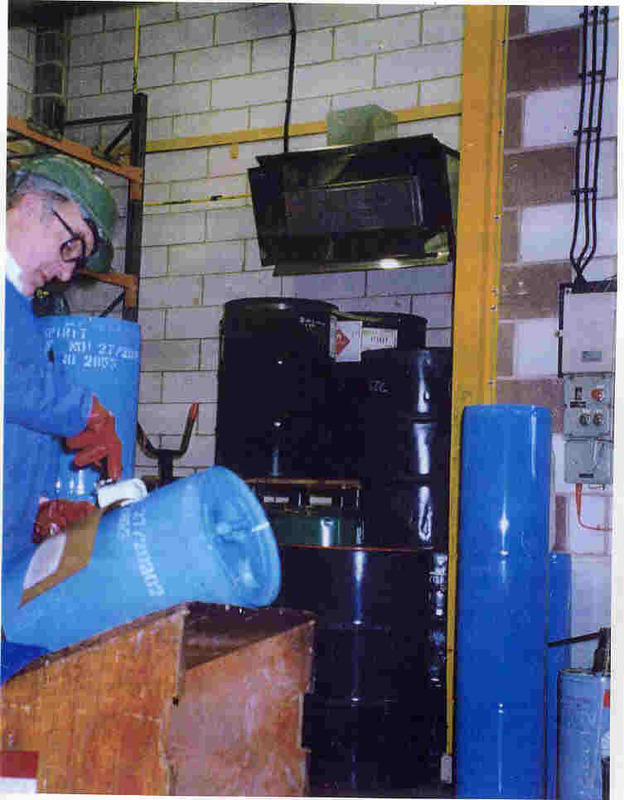 Bruest heaters will not ignite flammable vapors or liquids such as paint solvent, even though the surface temperature can be over 400 degrees C. The ATEX approval is for Zone 1 and Zone 2 explosive atmospheres. The flameless nature of the Bruest heater allows the use of gas where fire and explosion risks would otherwise render it unsafe, such as in paint spray-booths and drying rooms. Our heaters provide safe , economical ,radiant heat which can still be felt when your extraction in on. Bruest heaters can be retro-fitted to spray-booths to create bespoke catalytic box ovens for drying paint on wood, metal, plastic and a variety of other substrates. Such systems can slash drying times and improve finish quality. 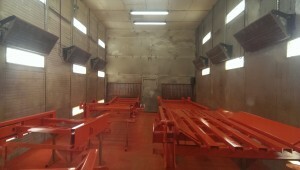 Retrofit of Bruest heaters to the walls of a combination spray/drying booth. 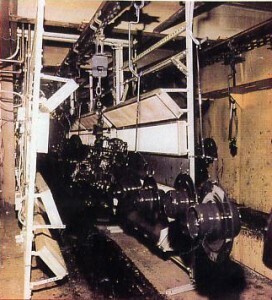 The Bruest heaters replaced the existing hot-air convection system. It cut paint drying times from several hours to just one hour and cool-down times from 1 hour to just 20 minutes thereby tripling production of these heavy metal weldments used in the production of mining and screening equipment. 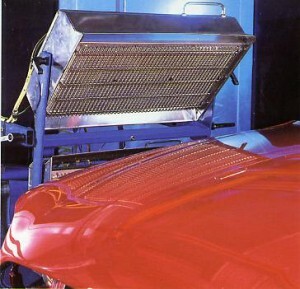 A Bruest heater ( fitted with a reflector) wall-mounted in flammable material paint store room. 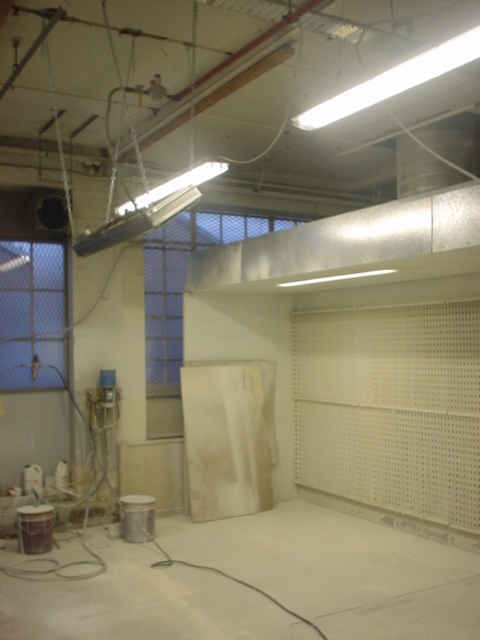 Bruest heaters are ideal for providing safe, reliable and economical heat in hazardous areas such as paint spray-booths, paint stores, F.R.P. 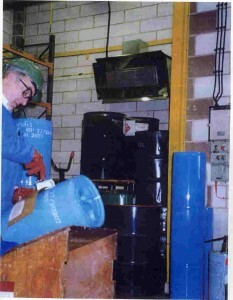 workshops and LPG filling stations. They are even used on off-shore gas drilling platforms and heating of natural gas distribution facilities. Bruest heaters will not ignite flammable liquids or vapors. However, as the surface temperature can exceed 400 degrees C the minimum clearance distances from ordinary combustibles (set out in the installation guide) should be complied with. Unlike flame infrared, Bruest thermo-catalytic heaters can be used inside paint curing booths, ovens and tunnels to directly radiate painted products with no risk of their igniting the explosive vapors evaporating from solvent based paints, without a flash-off period. The ability to directly and immediately radiate painted products means much greater heat transfer efficiency. Catalytic ovens are typically three times as quick as hot air ovens. Bruest thermocatalytic heaters are more reliable than many types of electric infra-red whose tubes and elements are susceptible to blowing and which can be expensive to replace. Bruest heaters are also more effective than electric infrared as their emission spectrum ideally matches the absorption spectrum of organic coatings. Our catalytic heaters are ideal for providing localised heat for automotive “smart repair.” On mains gas, they are of course cheaper to run than electric units.